Great Article Klaus!!! And thanks for sharing it with us!!! I've been wanting to keep tropheus for a long time, at first fear kept me from trying them and since my confidence has grown enough to try them I haven't been able to afford what I want... but the day is coming. Gotta keep the faith. Klaus, a couple of questions. You said you tried feeding pellets without success -- did it cause health problems for the fish or did they just not like the food? And would a tank with the footprint of a 55 gallon be too small to house a small colony? 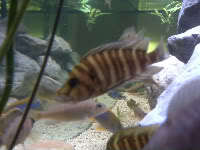 As for the 55g tank.........well I have kept a group of 10 T. sp. "Zongwe" in a 4 foot 55g and it worked. I have kept many groups of 12-15 in 4 foot 65g and had no problems. Now I do not recommend to do that because a "small" group should not be less then 12 individuals and the smaller the tank, the bigger the stress, the more is the likelihood of bloat. What is the foot print of your 55g? My 55 gallon is an old style one; it's an inch shorter and has an extra inch front to back, so it's 4ft. x 13in. I also have a 60 gallon that has the 4ft. x 12in footprint of a standard 55, but it has extra height. The 60 gallon is lightly stocked with some saulosi, so it's the only one with a possibility of becoming usable in the foreseeable future. back in April of this year. juveniles in a 75 gallon tank along with 5 small catfish. is flake food from Ken's fish! things scheduled without much variance. I love routine, I hate change, and I love to eat! I am glad I read this. Ok I am getting ready to take the tropheus plunge. Not converting to Tangs completely but as a lover of all beautiful fish these guys seem right to take a chance with. One question is about what food to use. I started with the extreme cichlid pellets but I ended up with a few fish getting bloat. Since I have switched to NLS I haven't had a fish with bloat since. It may have been I was new at the time when using the extreme but I don't have any confidence in using it now for the tropheus. What other foods would you suggest? I feed my Tropheus either Kens Premium Veggie Flake or HBH Veggie Flake. I do this for many years and bloat has been a foreign wort to me. I have tried feeding pellets but with little success. Good luck to you. I know you will enjoy them. Ok thank you Klaus I will try the Ken's flake and very nice article I hope its as easy as you make it seem. Splash! wrote: I hope its as easy as you make it seem. Nikki, just stick to the routine, especially the water change every week and leave them allone. I promise you, it will be "a piece of cake". Great to hear that your Tropheus are doing fine. You sure sound pretty happy too. No reason to be overly cautious, just keep doing whatever you are doing now and you will have a lot of fun with them. BTW, how about some pictures?????? Yeah I'm really happy I love these guys. Nice article, thank you for the share.